Before I start to write about the music, just take a look at that glorious yellow vinyl. Nothing makes me happier than when a label really nails the color. It's just perfect lemon yellow and I think it adds to the overall packaging quite a bit. 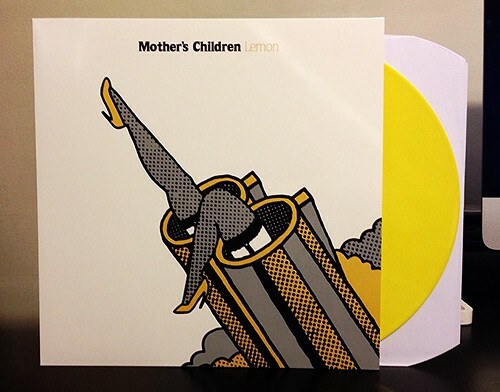 Lemon is the long awaited follow up to Mother's Children 2010 debut, That's Who. I guess in the four years between records (Aside from releasing a few killer EPs) the band must have been sequestered in their Canadian bunker, tirelessly crafting a new bunch of pop songs to unleash into the world. That's what I assume anyway, as the resulting record is fantastic and more focused than their debut. While That's Who had a somewhat more relaxed vibe, Lemon feels tighter with more attention paid attention to detail. The songs are catchy, the vocals are great and the band has always had heaps of attitude which comes through as well. The guitar work sounds polished without sounding overproduced. It's really a case study in a band's ability to balance an upbeat, fun record that doesn't devolve into sloppy chaos or go too far the other way and have the production zap the fun and authenticity from the songs. Mother's Children are just further proof that the best rock and roll in the world is coming from Canada these days.